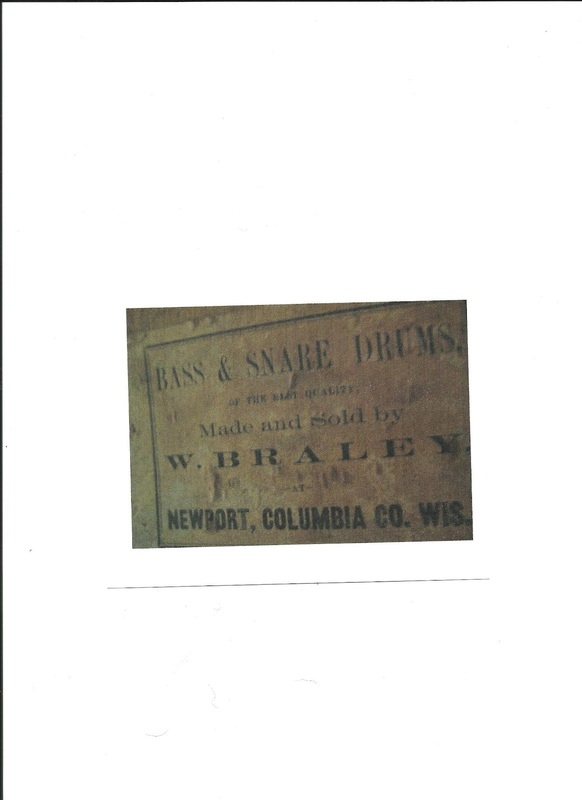 J. Dexter wrote asking whether anyone has ever heard of this drum maker/retailer: W. Braley of Newport, Columbia County, Wisconsin. 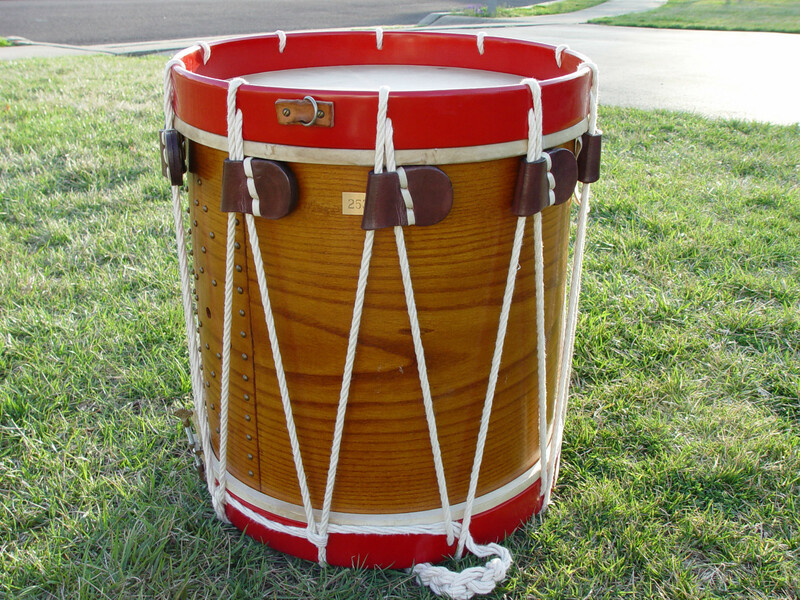 Many say that the Cooperman Drum Company's products are excellent. 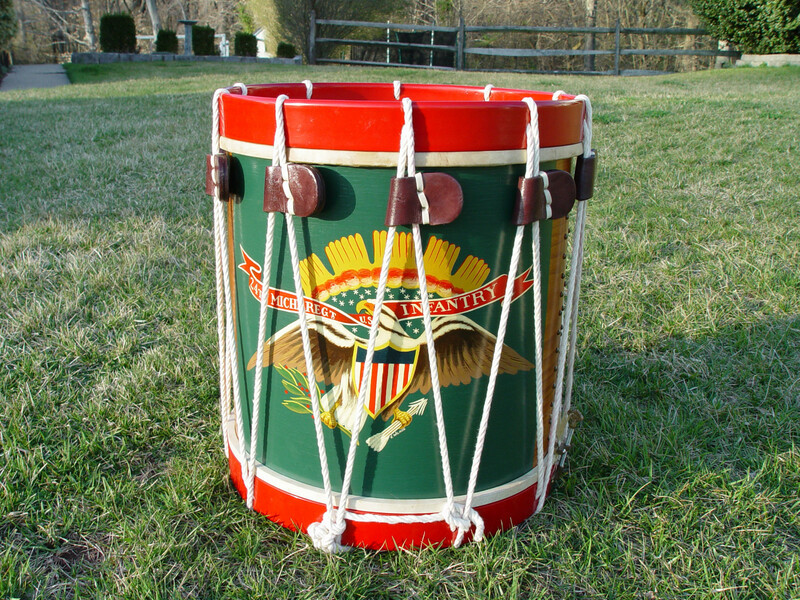 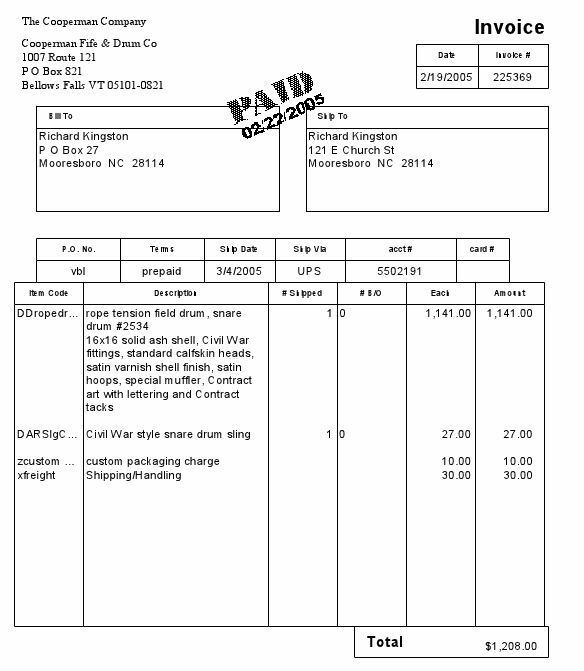 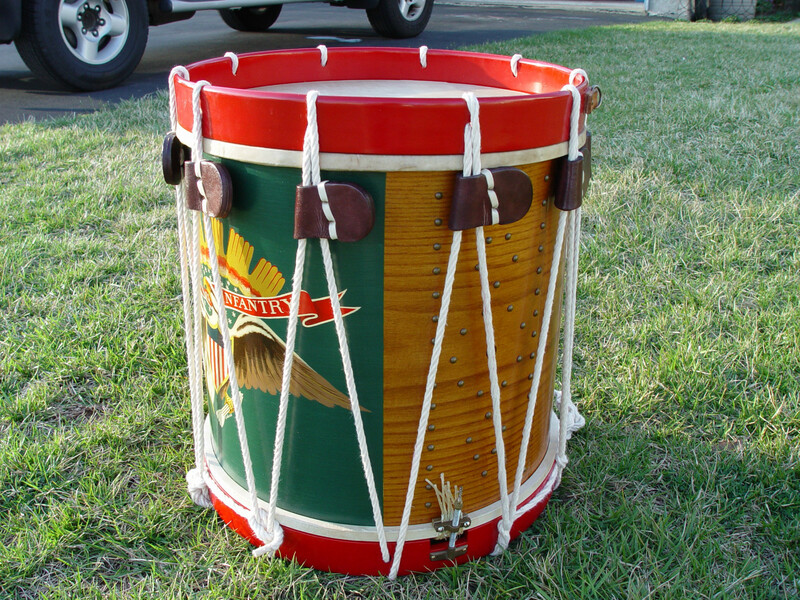 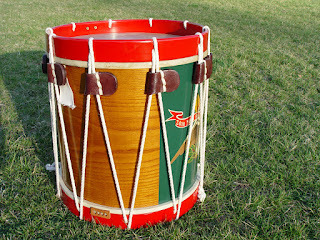 This 2005 drum with sticks and sling originally sold for $1,208 (including packaging, shipping and handling). 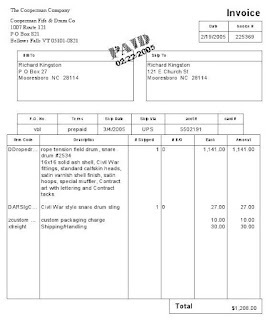 It sold recently on eBay used for $925, the reserve price. Chances are good that had the reserve been set higher, one or both of the two "must have this" buyers would have gone there. 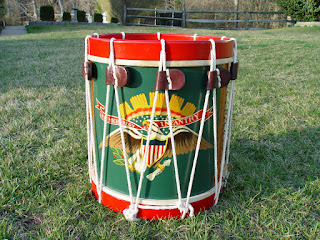 Beautiful Cooperman Rope Tension Civil War Field Snare Drum. 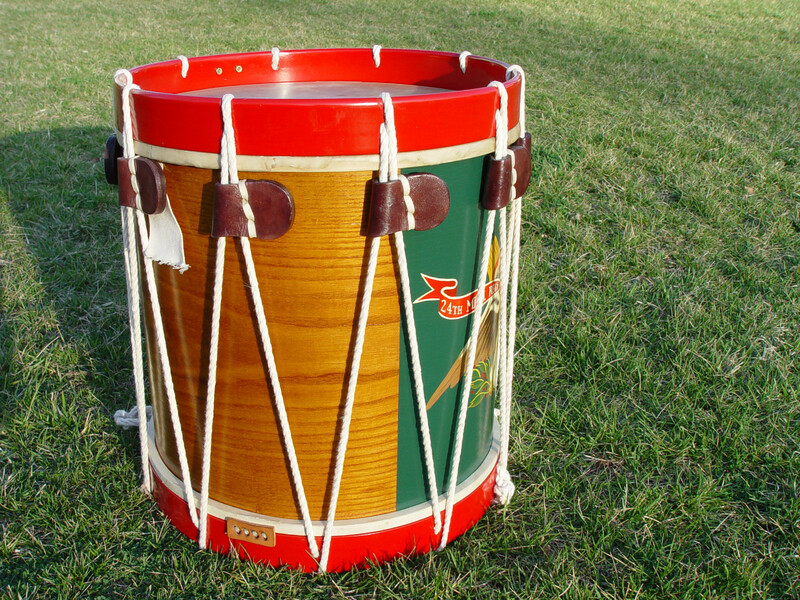 This drum is immaculate in MINT condition. 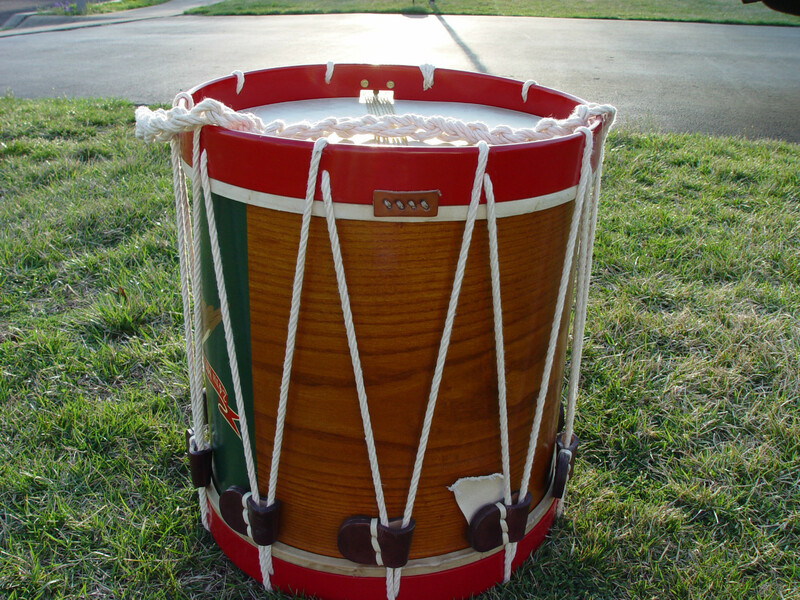 Looks just like the day it was handcrafted by Cooperman Drum Company in 2005. 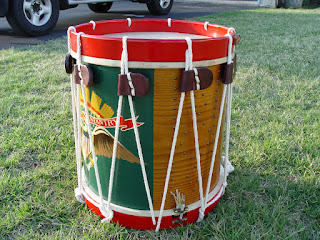 This is a 16x16 Ash shell that measures 19 x 16 with the hoops. Cooperman seal inside the shell, drum #2534 brass plate. 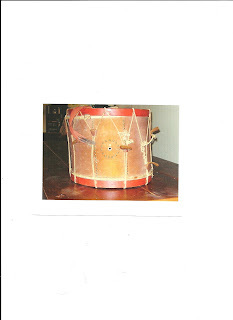 The ears are standard Liberty ears, standard strainer and calf skin heads. 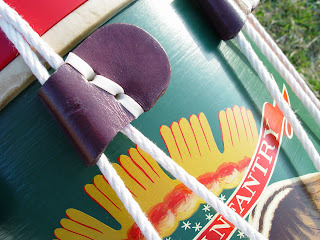 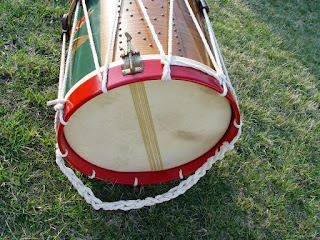 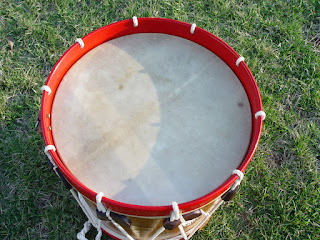 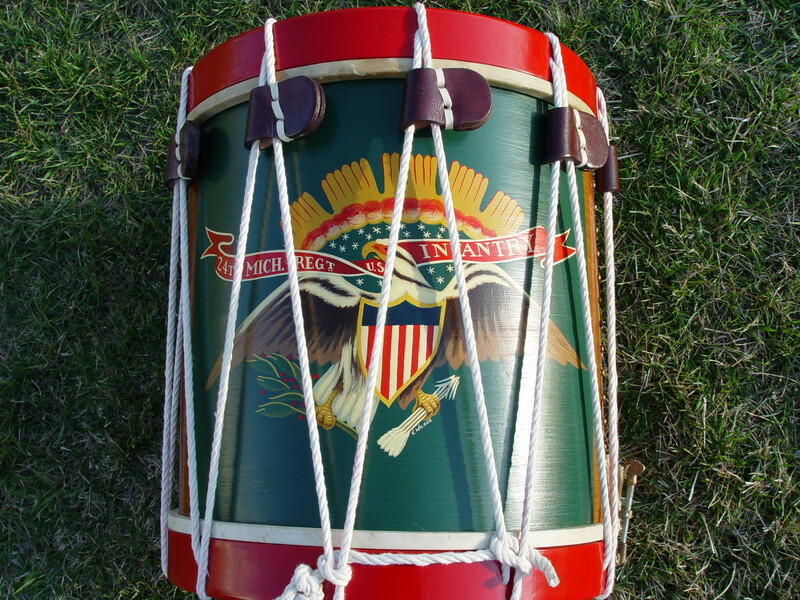 I am a Colonial Williamburg Fife and Drum Alumni and this was my personal drum, but just do not need it any more and want to pass it on. 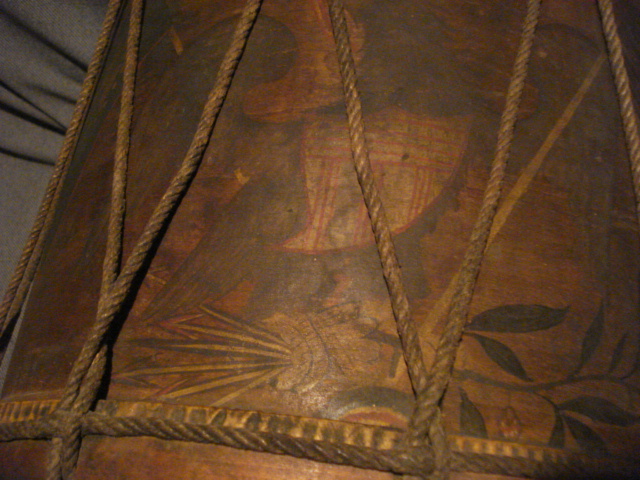 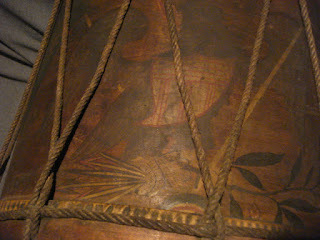 I was and am attracted to the drum because of the unbelievable eagle artwork on the shell. 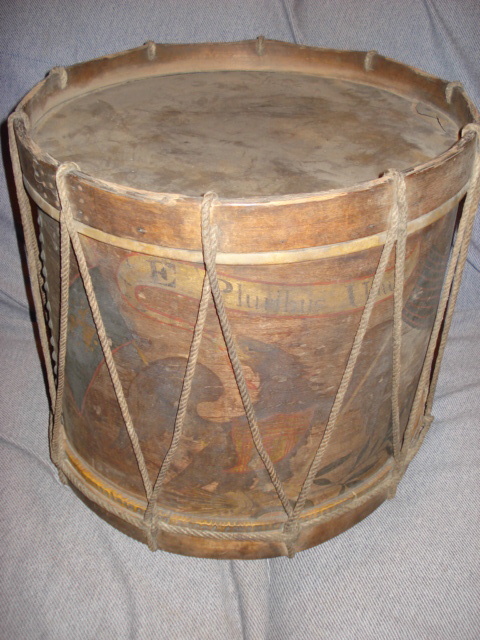 It reads "24th Mich. Regt.. U.S. Infantry" The artist is V. Wilkos. This snare has a beautiful tone, one of the best sounding rope drums I have played, it's all pulled up and ready to go. 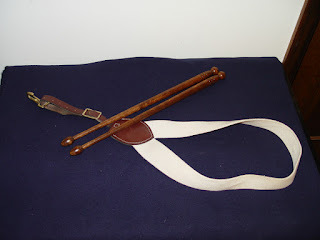 Civil war style sling and sticks are included. 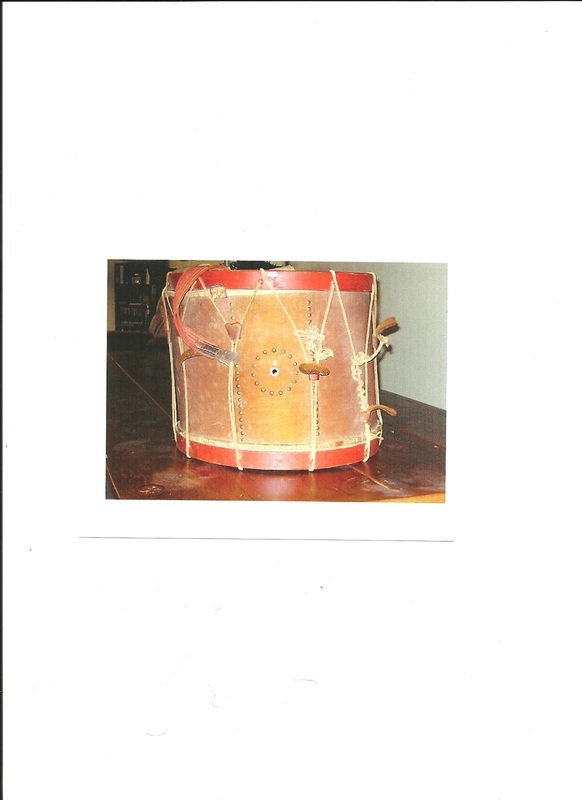 The drum I have measures about 17 inches in diameter, and 15 inches tall. 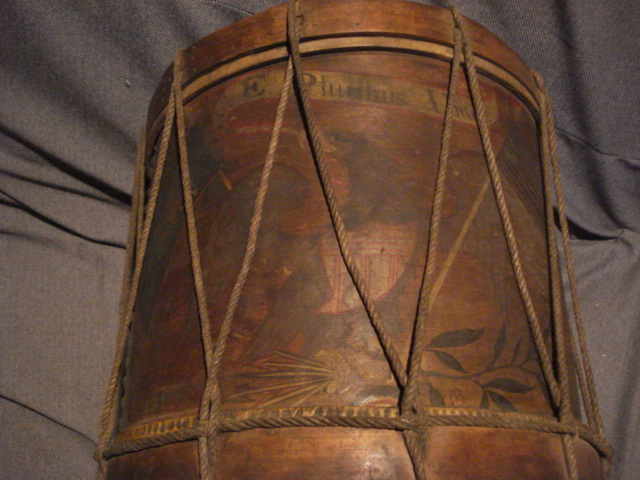 This drum seems to have quite a bit of design. 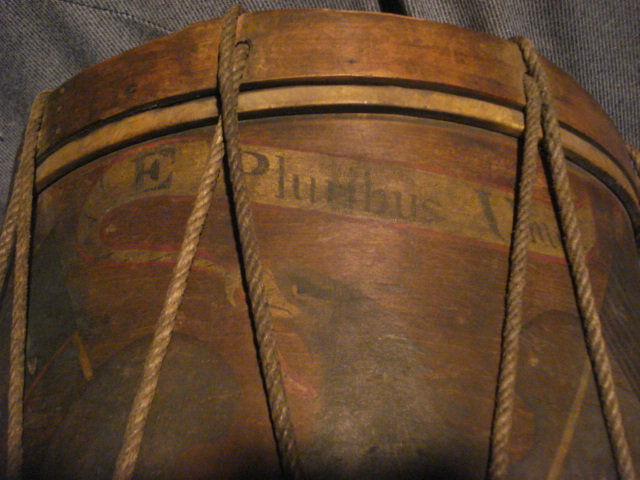 There is a large eagle which has "E Pluribus Unum" above it. 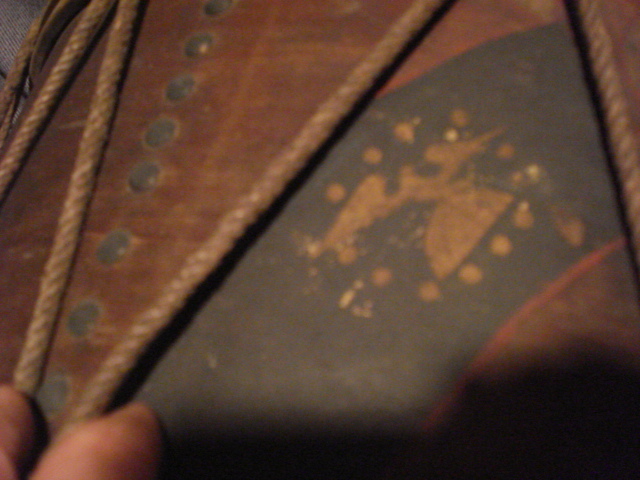 Has arrows and olive branch in feet. 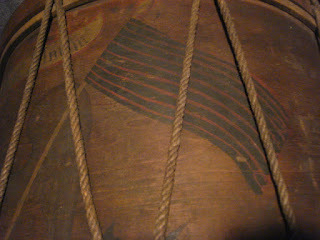 Flag on his chest with red stripes. 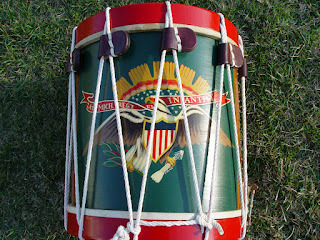 Then also has flag on both sides of large eagle. 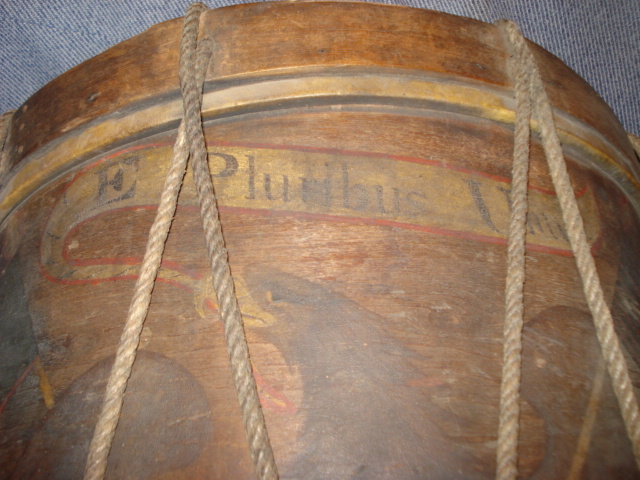 One flag shows eagle on half globe with 12 stars or dots around it. I believe this may be from New York area. The other flag has a dark back ground with nine red stripes. 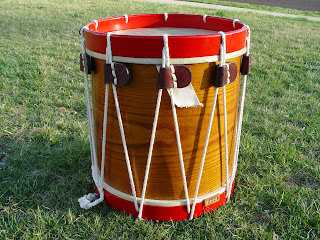 This drum has gotten dark over the years, I was told if it were professionally cleaned design would stand out more. Any information would be greatly appreciated. 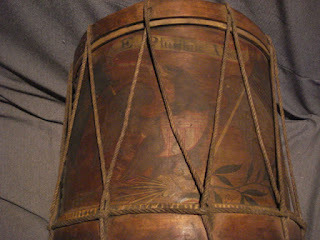 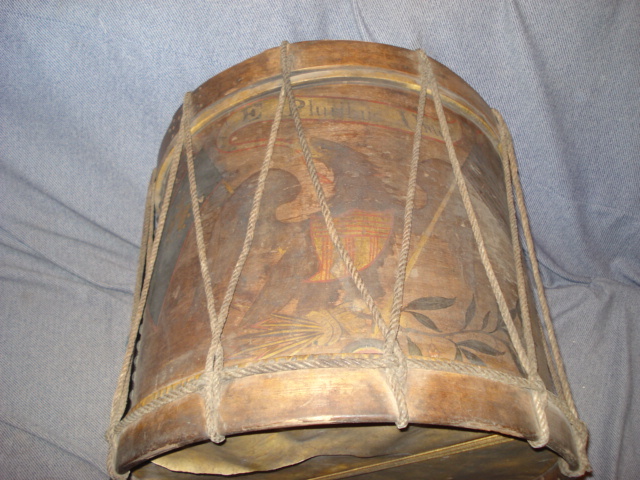 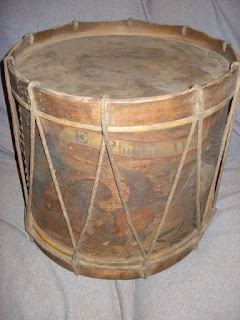 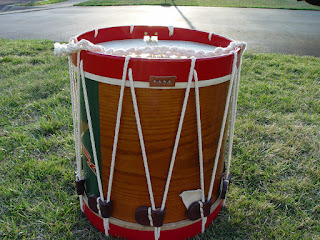 A reader (Victor Baruzzini of St. Louis) wrote that he inherited this drum and that the tag (written in the 1950's) identifies the drum as an antique Belgian snare drum from the 1800's. Readers with information or opinions are welcome to comment below or email us at Blogmaster@FieldDrums.com. See also CW(?) 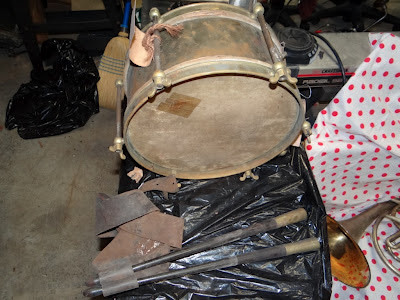 Brass Drumstick Holder and Capped Sticks, this blog, April 15, 2010. 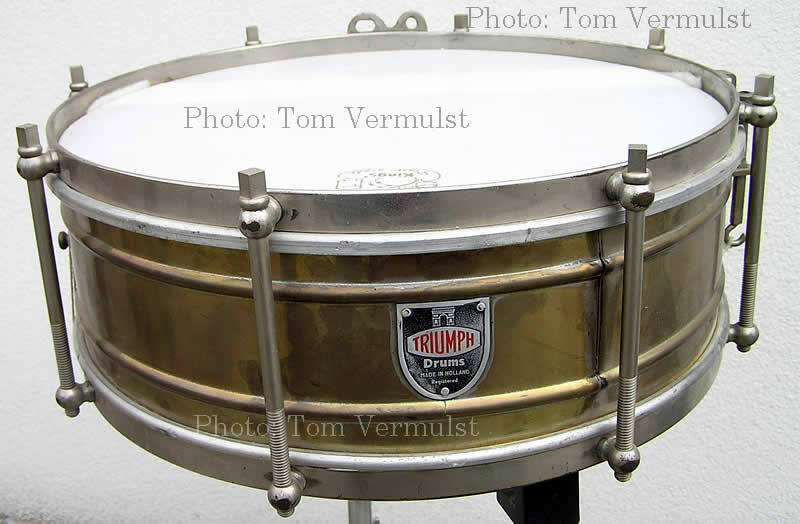 See a short discussion of the Triumph marching snare drum which bears some similar design features but which is, of course, more modern (ca. 1945).